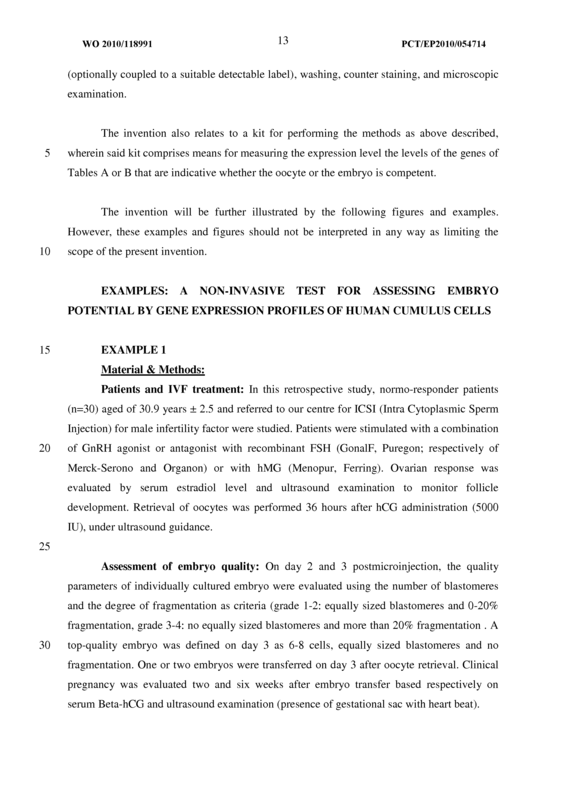 The present invention relates to a method for selecting a competent oocyte or a competent embryo. 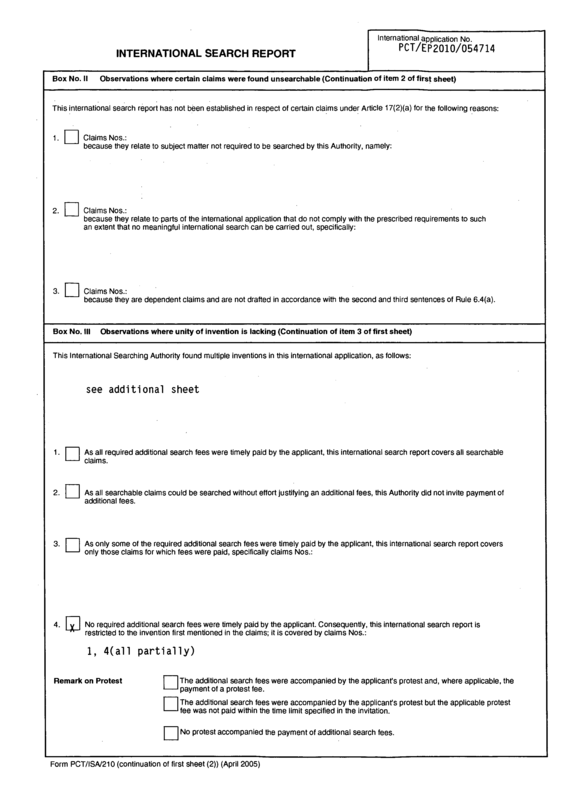 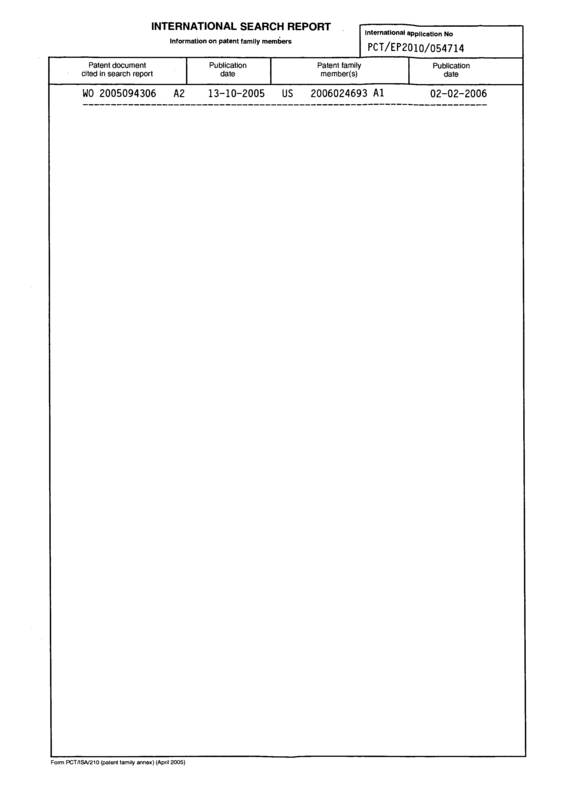 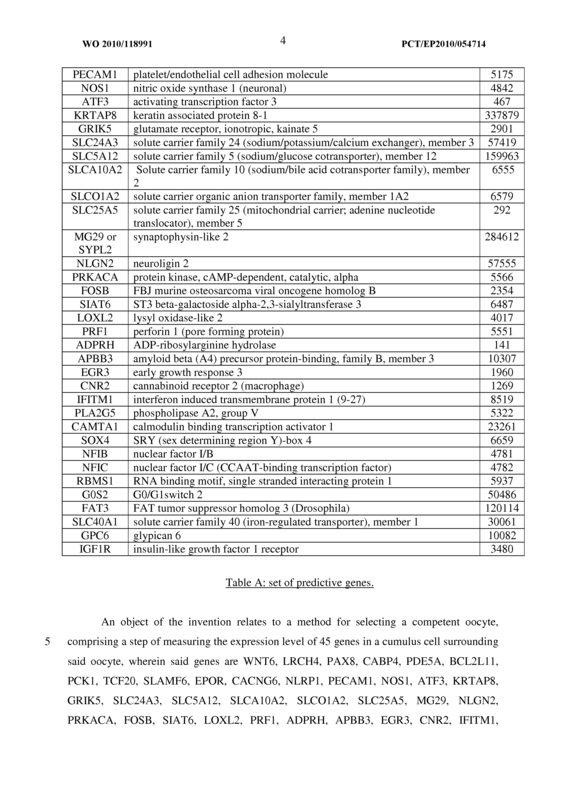 B consists of FOSB, NLGN2, PDE5A, PLA2G5, GPC6, and EGR3; and group C consists of NFIB, NFIC, IGFlR, G0S2, GIRK5 and RBMSl. 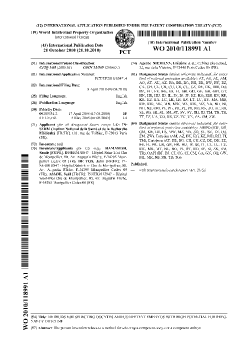 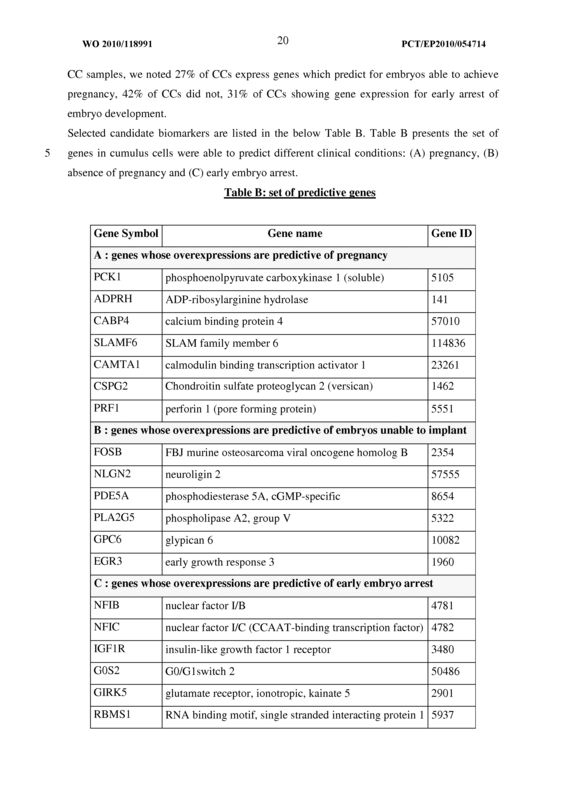 SLAMF6, EPOR, CACNG6, NLRPl, PECAMl, NOSl, ATF3, KRTAP8, GRIK5, SLC24A3, SLC5A12, SLCA10A2, SLCO1A2, SLC25A5, MG29, NLGN2, PRKACA, FOSB, SIAT6, L0XL2, PRFl, ADPRH, APBB3, EGR3, CNR2, IFITMl, PLA2G5, CAMTAl, SOX4, NFIB, NFIC, RBMSl, G0S2, FAT3, SLC40A1, GPC6 and IGFlR. 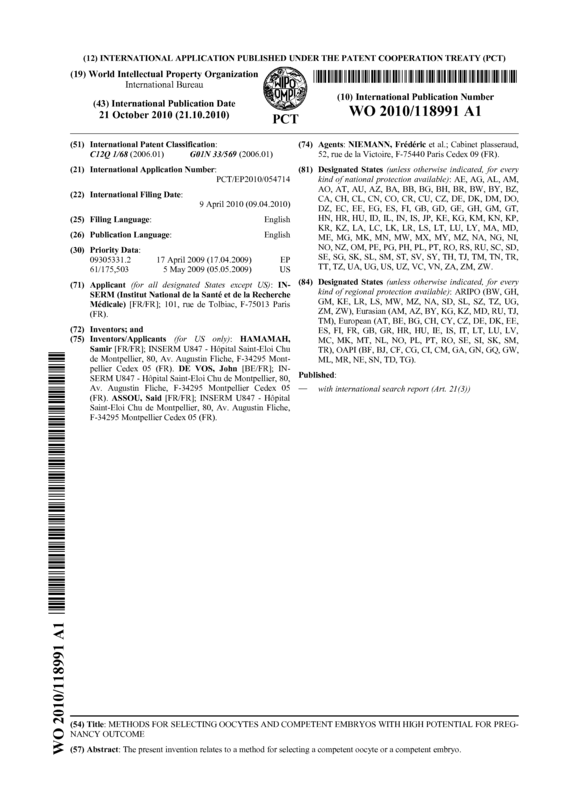 PRKACA, FOSB, SIAT6, L0XL2, PRFl, ADPRH, APBB3, EGR3, CNR2, IFITMl, PLA2G5, CAMTAl, SOX4, NFIB, NFIC, RBMSl, G0S2, FAT3, SLC40A1, GPC6 and IGFlR. 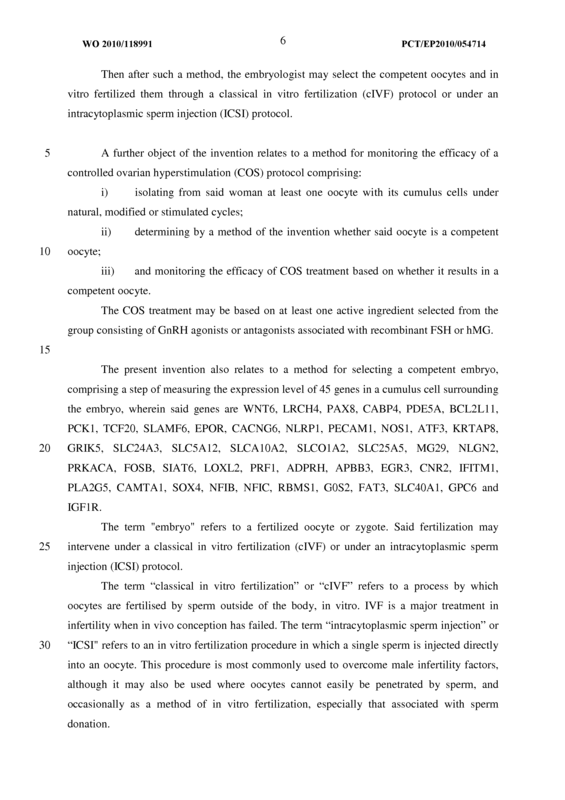 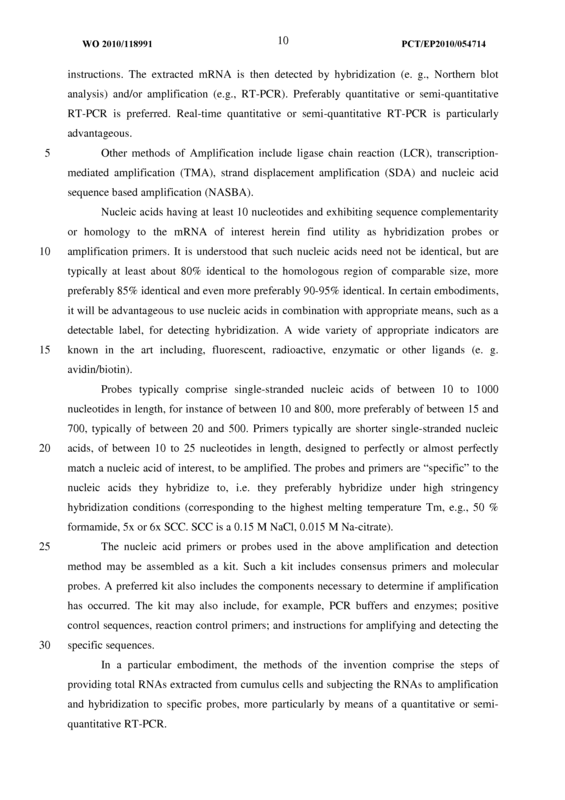 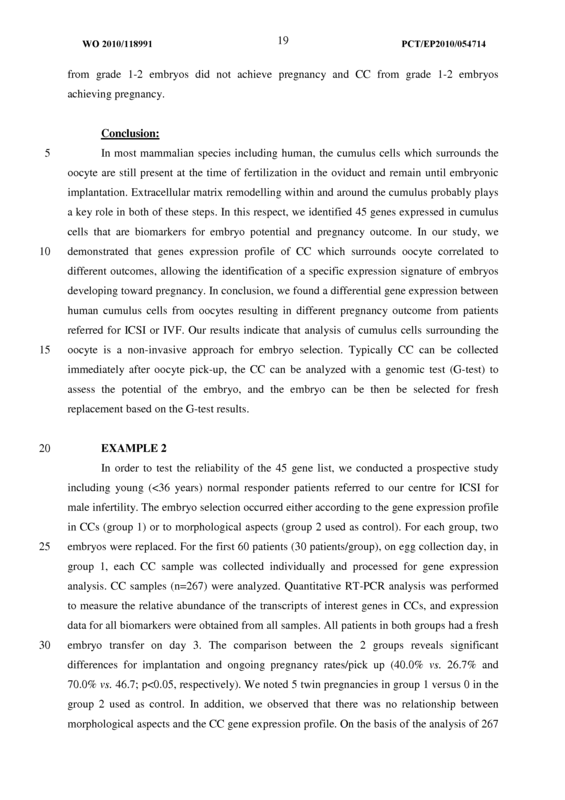 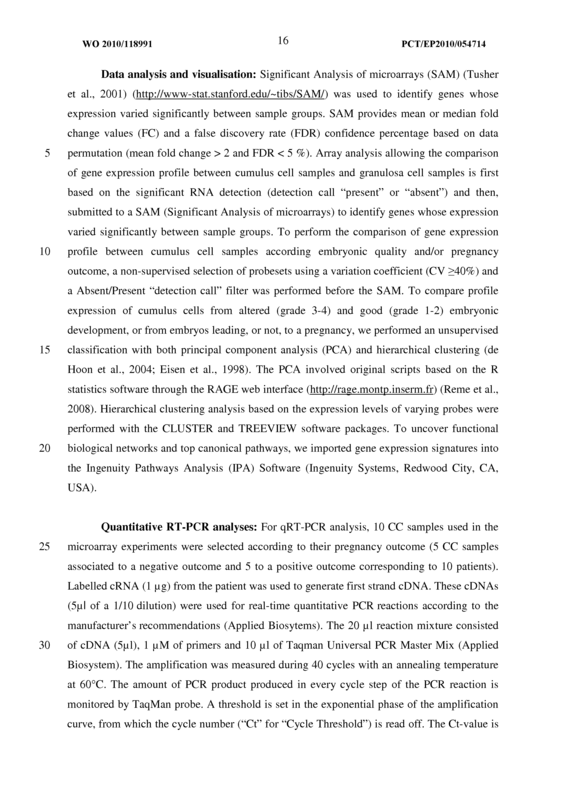 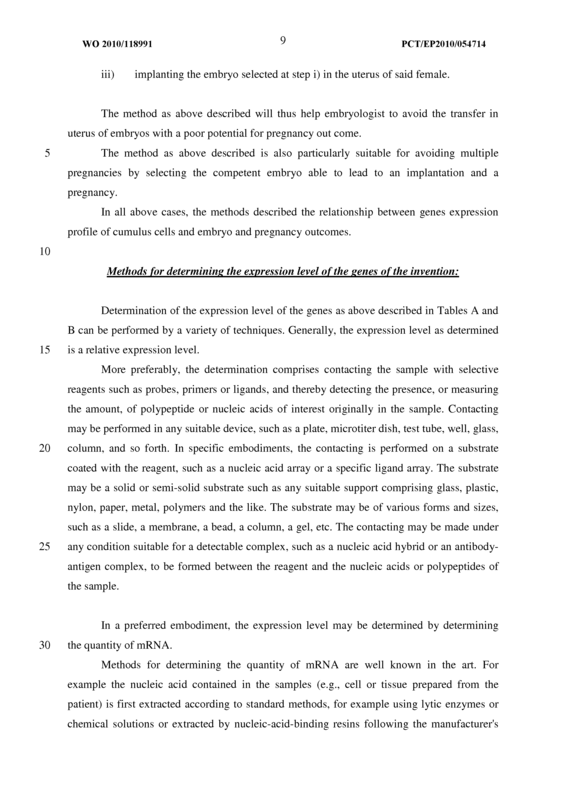 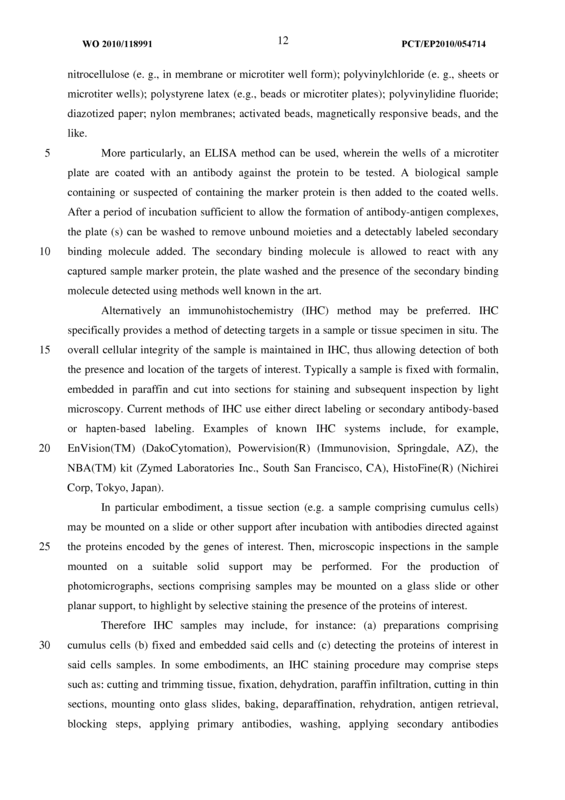 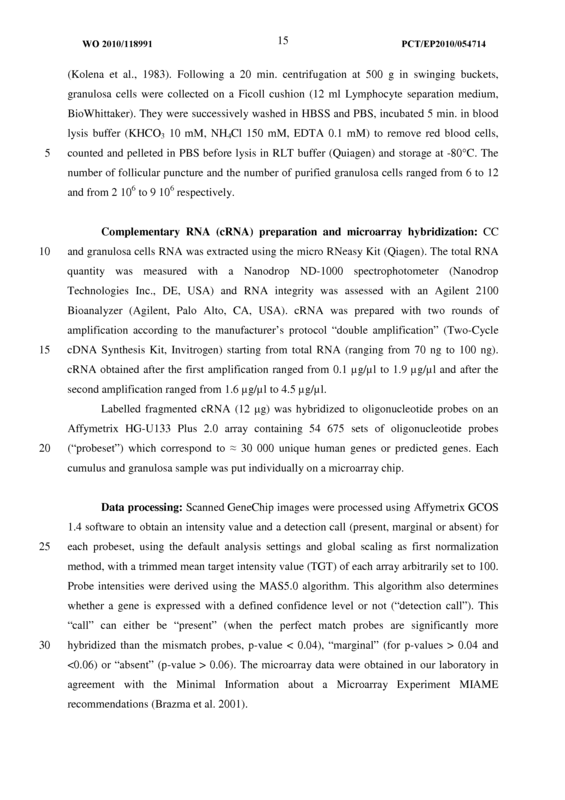 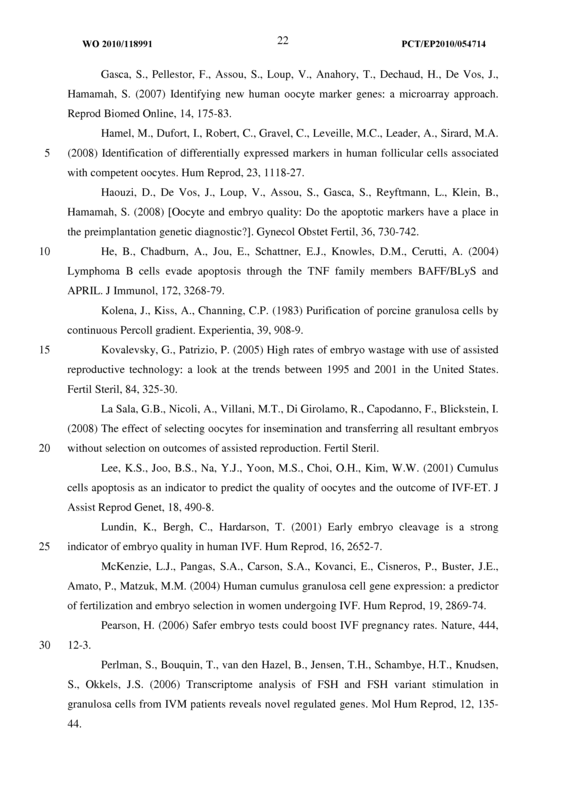 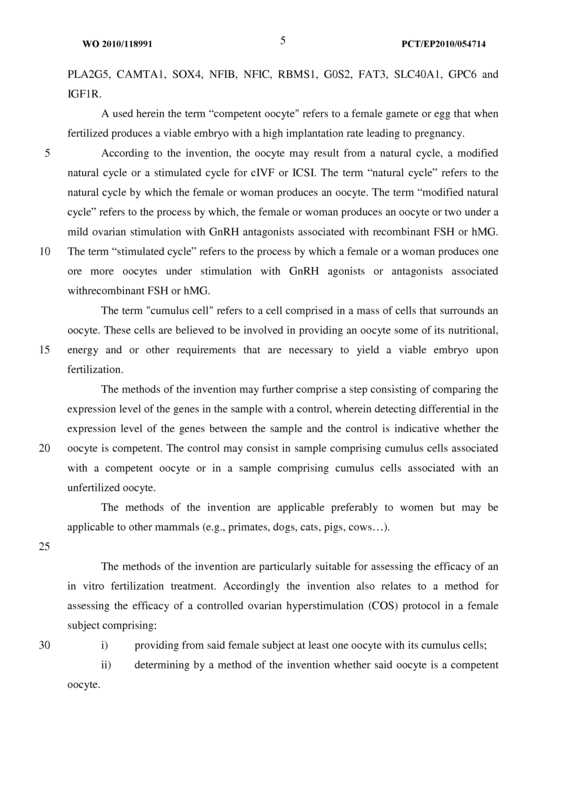 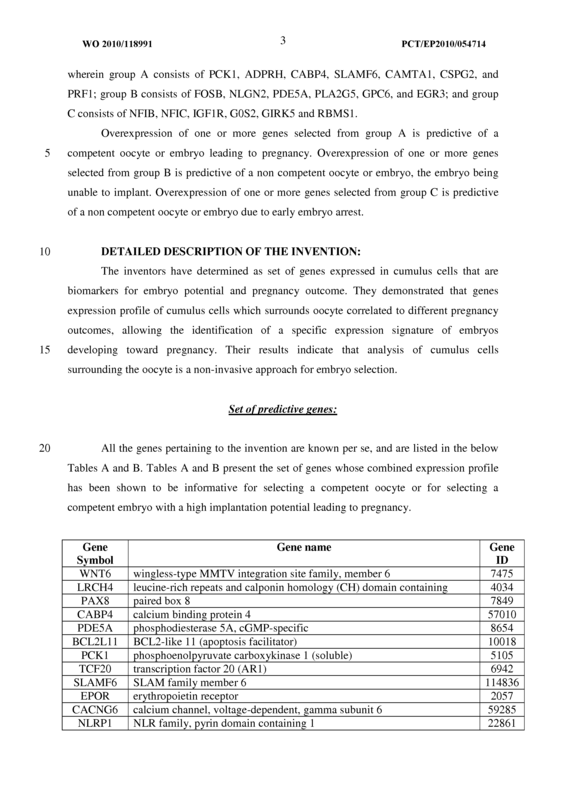 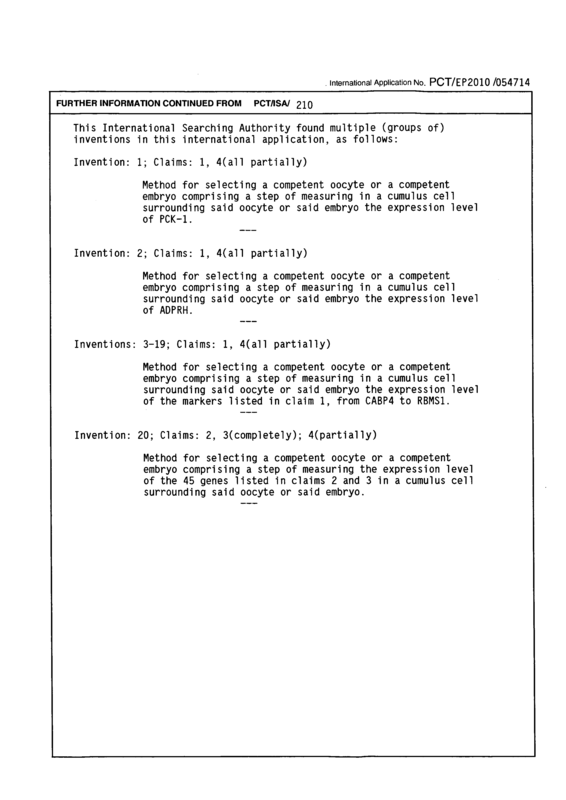 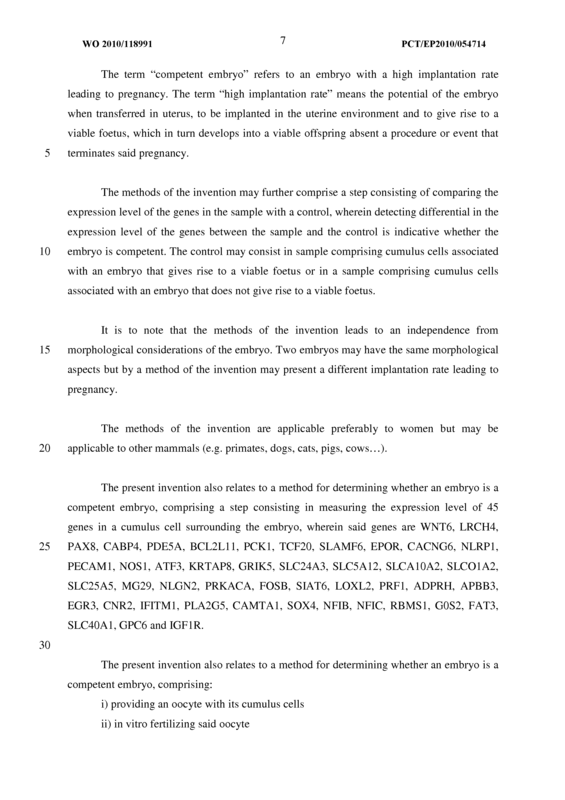 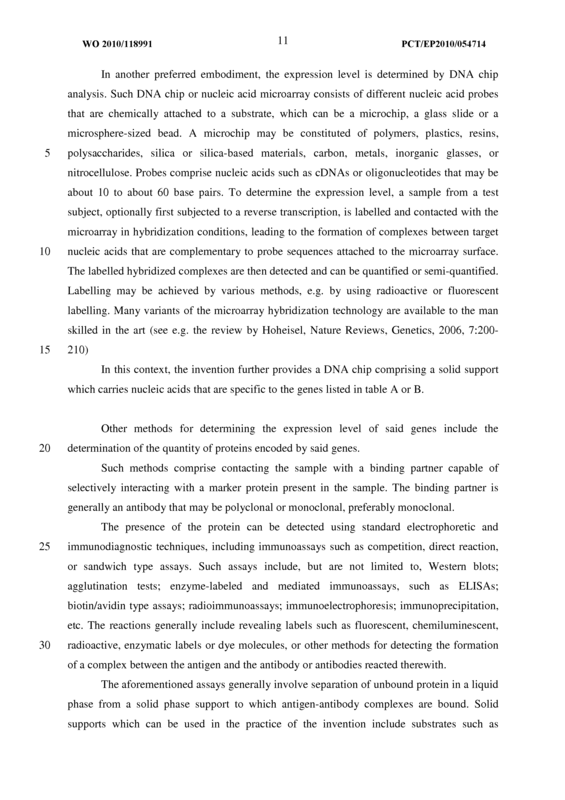 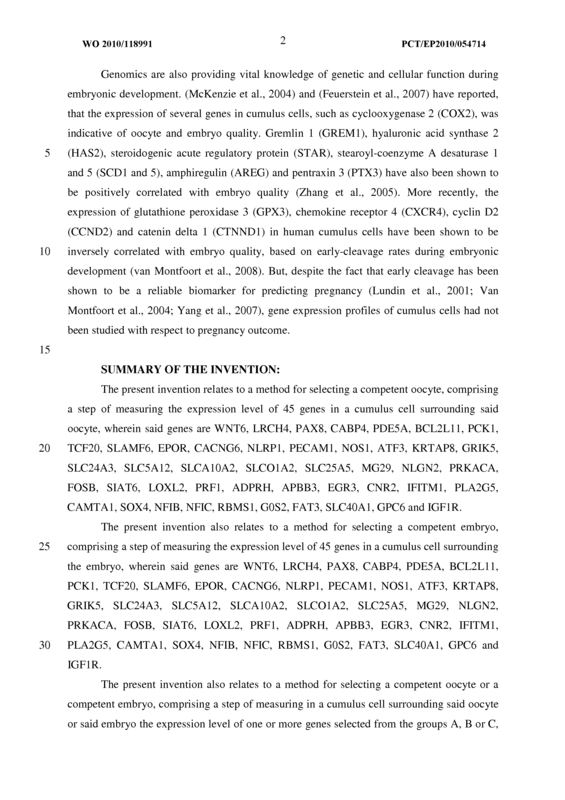 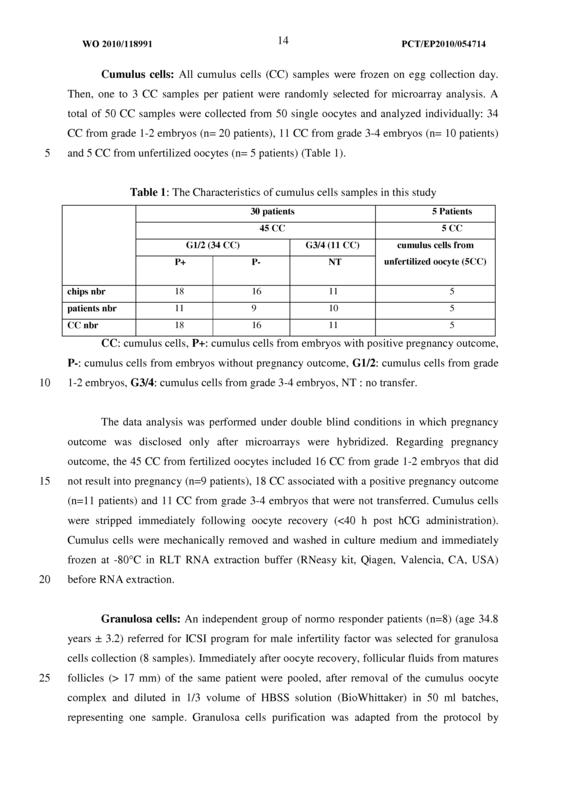 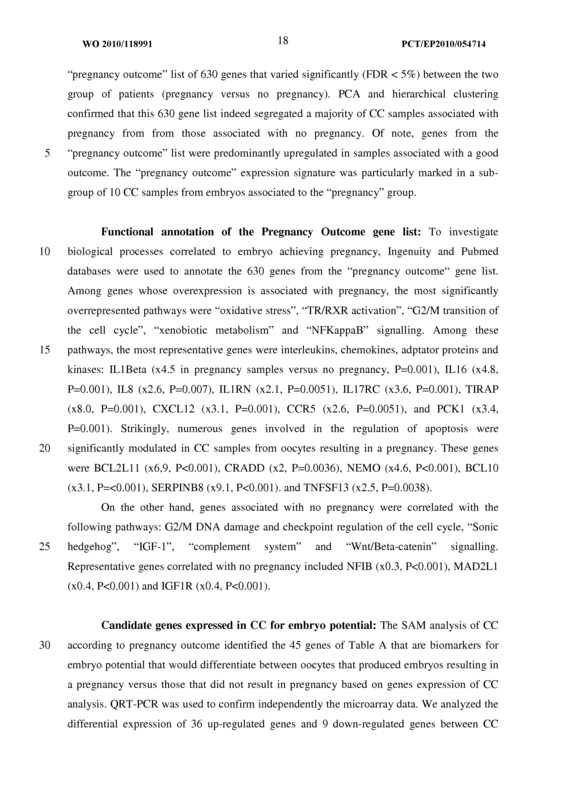 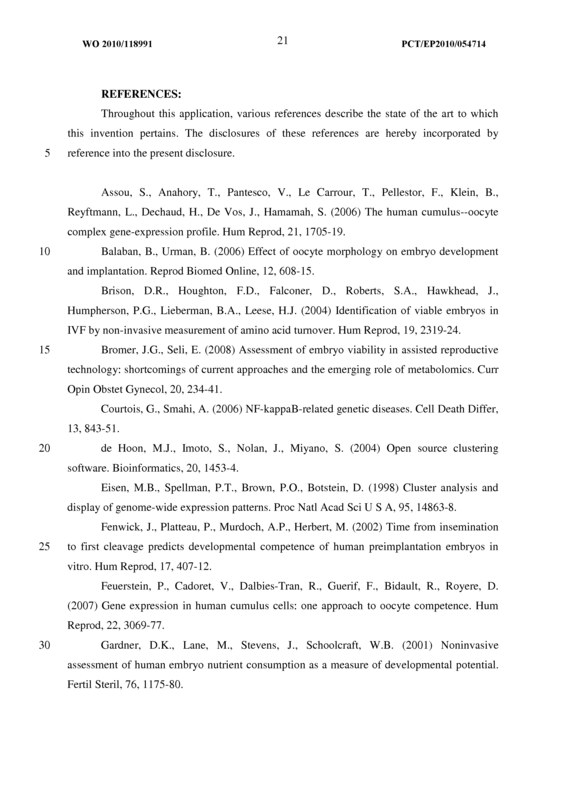 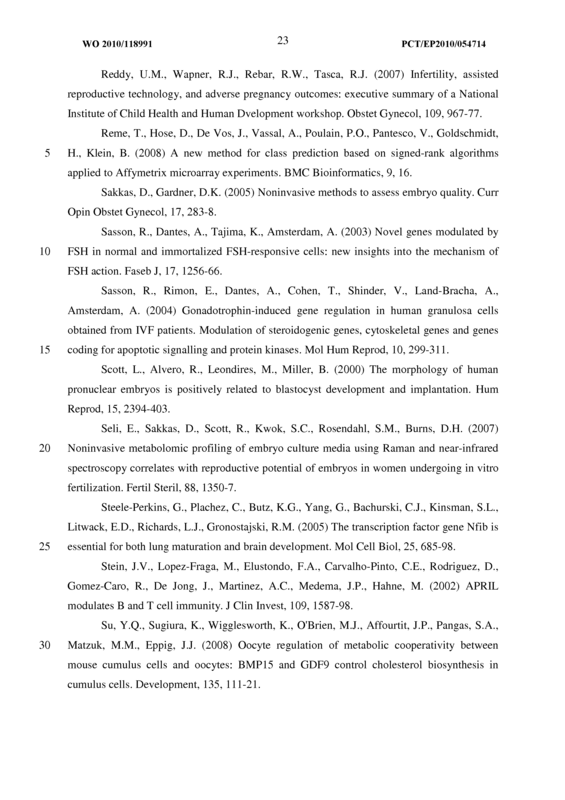 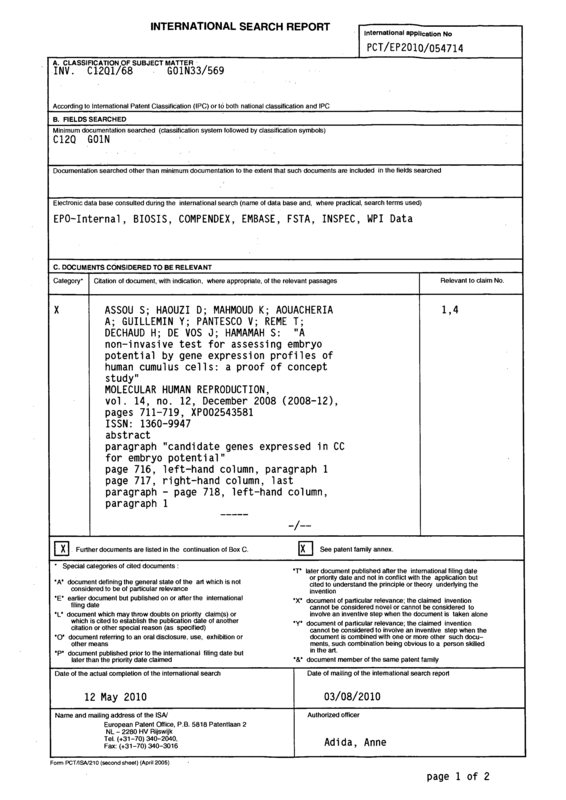 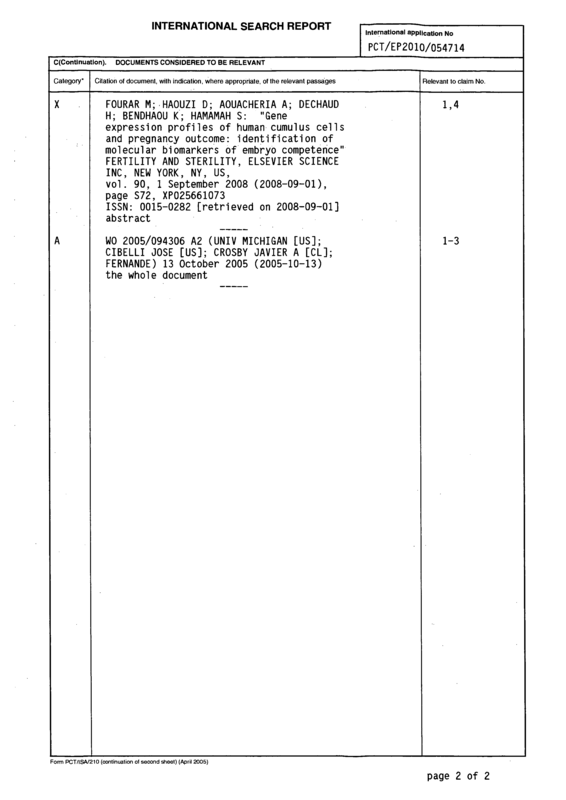 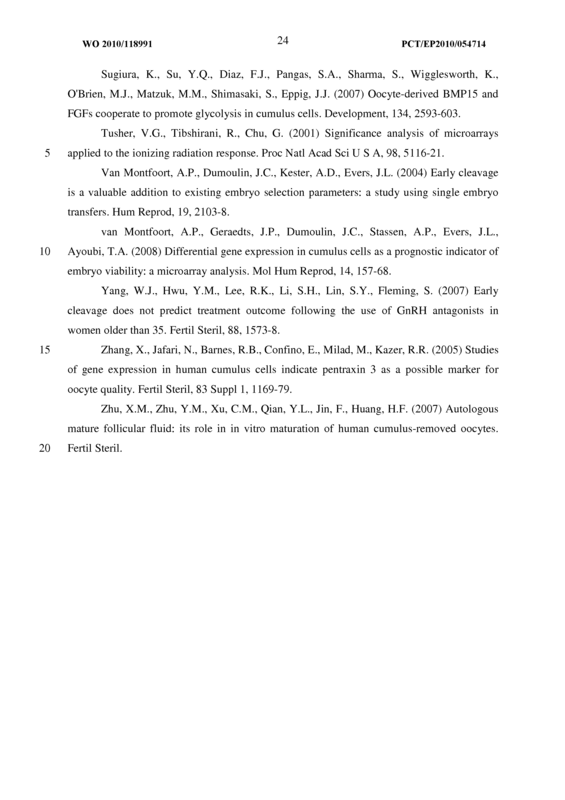 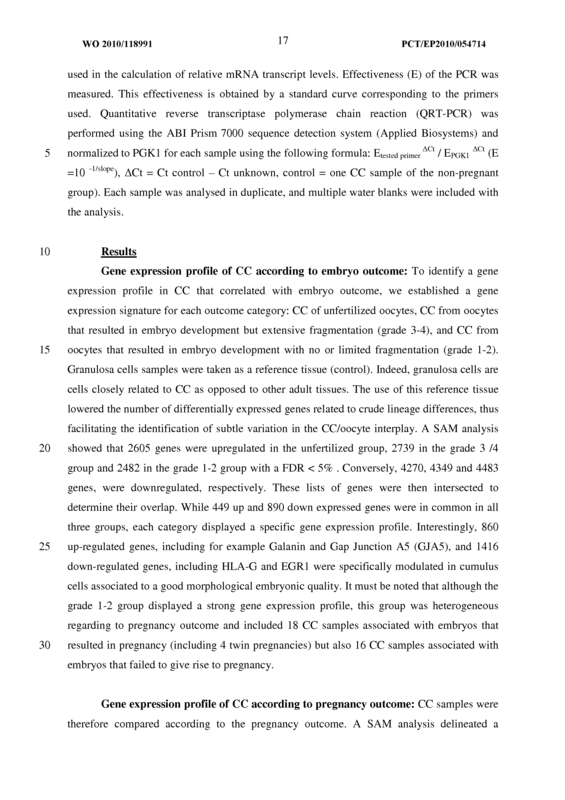 The method according to any of claims 1 to 3 which further comprise a step consisting of comparing the expression level of the genes in the sample with a control, wherein detecting differential in the expression level of the genes between the sample and the control is indicative whether the oocyte or embryo is competent.